CoachAccountable is a Coaching App! But Also, Not an App. Here’s a feature you may not know already exists! Coaches (and clients) often ask whether CA’s online coaching platform has a downloadable app (from the Apple App Store, Google Play Store, and so on). The answer is YES! But also no. To clarify: CoachAccountable is a web-based app, meaning…. Version 3 is specifically designed to look great on any mobile device. CoachAccountable automatically resizes, consolidates menus, and just plain looks nice (and more importantly plays nice) on mobile devices. Your coachees don’t need to download anything. This also means no troubleshooting with things like “Do I have the most updated OS installed on my phone?” or “Did I install another app that’s breaking CoachAccountable, or vice-versa?” These simply aren’t issues. You’ll want to have CoachAccountable installed on their home screens as soon as you invite them to the system, so that they can quickly log in. Send clients HERE for simple instructions. CoachAccountable will look like a regular app – clicking the app icon will magically go directly to the online coaching platform. Fun fact: If you have White-Label Branding set up (and you should, because it’s now FREE), the app tile is YOUR logo and brand name, like this. 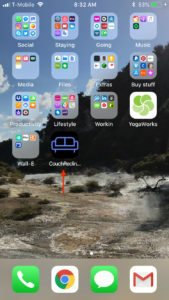 CouchReclinable teaches coachees how to really relax. If you like the look of our coaching platform and think it’s cool, but you haven’t signed up for CoachAccountable yet, come on in and try it free for 30 days! We’re happy to help you get set up and answer any questions you have along the way.